How much poverty is there? What can be done to reduce and even eliminate it? In reviewing the history of thought on poverty, I was struck by how much mainstream thinking has changed over the last 200 years. We see a transition in the literature and policy debates between two radically different views of poverty. Early on, there was little reason to think that poor people had the potential to be anything other than poor; poverty would inevitably persist. Prominent thinkers even argued that poverty was necessary for economic advancement, since without it, who would farm the land, work the factories and staff the armies? Avoiding hunger was the necessary incentive for doing work. This way of thinking still left a role for policy in providing a degree of protection from shocks, which helped assure social stability in the wake of crises. The protection motive for antipoverty policy goes back well over 2,000 years in both Western and Eastern thought. While the need for social protection was well understood in principle among the elites, their support tended to fade in normal times, and often needed to be re-established in new crises. However, mass poverty was largely taken for granted. Beyond short-term palliatives to address shocks, there was little or no perceived scope for public effort to permanently reduce poverty. Promotional anti-poverty policies made little sense to those in power. In the second, modern view, not only is poverty seen as a social ill that can be avoided through public action, but doing so is seen as perfectly consistent with a robust growing economy. Indeed, the right anti-poverty policies are expected to contribute to that growth by removing material constraints on the freedom of individuals to pursue their own economic interests. Poverty was no longer seen as some inevitable, even natural, condition, but as something that could and should be eliminated. The state came to be given a prominent role in helping to assure that all individuals have access to the essential material conditions for their own personal fulfilment—arguably the most important requirement for equity, but also the key to breaking out of poverty traps. Anti-poverty policy came to be seen as a matter of both promotion and protection. Along with rising real wages and (hence) savings by poor people, public education systems, sound health systems and reasonably well-functioning financial markets were deemed to be crucial elements for the next generation to escape poverty, for good. This transition in thinking came with much struggle. Many people came to protest, join community or religious groups, labour and civil-rights movements, or political coalitions of one sort or another to lobby for governmental action to help fight chronic poverty in multiple dimensions. The resistance to their efforts was often strong, and a great many brave people sacrificed their liberty and even their lives in those struggles over centuries. Successful promotion policies took time to evolve, and were invariably mediated by politics. However, in due course, a self-reinforcing cycle emerged in the successful countries to help assure a sustained and (over time) more rapid escape from absolute poverty. Success in implementing partial antipoverty policies often fostered success in securing broader coverage and implementing new initiatives. Progress has been slow in some periods and the cycle has been broken at times, with many setbacks. The history of thinking and action on poverty provides ample illustrations of the fragility of the progress that has been seen. Each major step forward was followed by a backlash in thinking and policymaking. We still see this today, with poor people being blamed for their poverty and even criminalised. But, as we strive to support efforts against poverty going forward, it is important to acknowledge the progress that has been made. The new millennium still has roughly one billion people in the world living in poverty (by the standards of what “poverty” typically means in the poorest countries). While the data are far from ideal, as best can be determined, there were also about one billion people in the world living in such poverty 200 years ago. The difference is that then they accounted for about four out of five people in the world, while today they account for one in five. 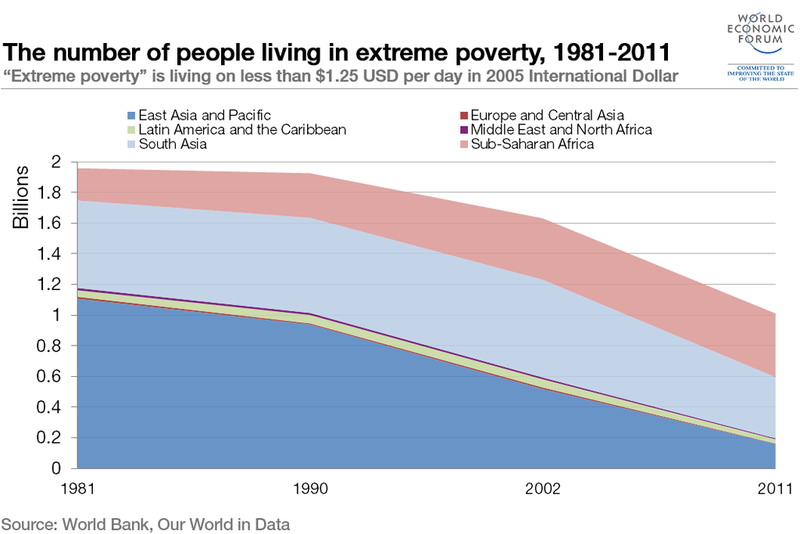 Since 2000 the developing world has been reducing the extreme poverty rate at about one percentage point per year—over three times the long-term annual rate for the world as a whole over the last 200 years. If this progress can be maintained, then the developing world will eliminate at least the most extreme forms of absolute poverty in a much shorter timespan than did today’s rich world. We should not, however, presume that the developing world’s new pace of progress against poverty will automatically be sustained. That will require good policies, and a measure of good luck. There are two distinct paths going forward. The low-case, ‘pessimistic’ trajectory entails that the developing world outside China regresses back to the relatively slow progress of the 1980s and 1990s. On this path, it would take another 50 years or more to lift one billion people out of poverty. This would surely be judged a poor performance. By contrast, an ‘optimistic path’ would be to maintain the higher growth rate for the developing world as a whole seen since 2000 without a rise in overall inequality. If that could be achieved then we can be reasonably confident of lifting that one billion people out of extreme poverty by sometime around 2030 (Ravallion 2013). What are the principle challenges in assuring that the second path is followed? Among the list of threats one can identify to attaining that goal, inequality stands out as a major concern today. Rising inequality can mean that growth largely by-passes poor people. This has been happening in some countries of the rich world, including the US. Experience among developing countries has been varied. Inequality falls about as often as it rises in growing developing countries, although absolute poverty measures tend to fall with growth. High-inequality countries have a harder time reducing poverty in that they typically need higher growth rates than low-inequality countries to attain the same pace of progress against poverty, and their high inequality often makes that growth even harder to attain. In thinking about the implications for policy it is important to un-pack inequality—to identify the specific dimensions most relevant to progress against poverty. Inequalities in access to good quality schooling and health care stand out in many developing countries today. In many rural economies, inequalities in access to land (including insecurity of rights over land) also remain an impediment to pro-poor growth. Gender inequalities stand out everywhere, though not just in terms of command over material goods. More pro-poor policies call for better quality public institutions and services that are inclusive of the needs of poor people. With the required political will there is much that can be done to improve health and education services in poor places and in making legal systems more inclusive. These are high priorities for antipoverty policy everywhere. While the “heavy-lifting” against poverty will probably continue to come from pro-poor growth processes, there is also an important supportive role for redistribution and insurance using state-contingent transfers, ideally financed primarily by domestic taxation. And that role is unlikely to be temporary; all countries need a permanent safety net. In thinking about the (many) options, policymakers in developing countries should be more open to the idea of only broadly targeted and largely unconditional transfers (as distinct from finely targeted conditional transfers). Improving tax systems in poor countries to expand the revenue for domestic antipoverty policies must also be a high priority. External development assistance should continue to play a role. This is ethically compelling in its own right but also as compensation for the costs rich countries impose on poor ones (such as through past contributions to the stock of greenhouse gases and the past injustices of colonial exploitation and trade restrictions). Aid has two important roles. First there will be emergency aid—short-term assistance to deal with crises. There will be concerns about moral hazard, which have to be taken seriously, but wealthier countries should be called upon to help poor countries deal with agro-climatic and other shocks. Second, development assistance should help foster the conditions for sustainable poverty reduction in the longer-term, including institutional development and building better public administrations (such as for domestic resource mobilisation). It must be acknowledged, however, that the record of development aid has been uneven, and not always well-considered in the light of what we have learned about the economics of poverty. For example, a common view among aid donors is that they need to incentivise better policies—to use a carrot and stick approach, rewarding good efforts and punishing bad ones. This is a risky strategy and may well push fragile states into a poor-institutions trap (Ravallion 2016, Chapter 9). Market failures are an important reason why inequality matters to progress against poverty. Credit market failures have been a prominent concern. The policy responses entail some combination of efforts to make markets and institutions work better for poor people and efforts to compensate for market failures through other means, including redistribution. Inequality can also undermine the potential for making such policies happen. Those who benefit from their ability to capture new opportunities will often resist reforms that try to assure broader access to those opportunities, also given that poor people on their own have little current capacity to compensate the non-poor losers from pro-poor reforms. History is full of examples. English industrialists in the 19th century lobbied against compulsory schooling and against bans on child labour, and helped stall those reforms for a long period. Indian industrialists in the post-Independence decades lobbied for trade protection that diminished the scope for poverty reduction through labour absorbing export-led manufacturing growth. Powerful landholders in both these countries (and elsewhere) effectively undermined the potential for land reforms and other redistributive policies. And in many countries, insiders in urban formal-sector labour markets (on both sides of the market) act to effectively restrict competition from outsiders. ‘Inequality’ is not a single idea, but takes many forms, and can be seen very differently by different people. This fact creates much debate—though sometimes this seems like a debate between ships passing in the dead of night, not seeing or understanding each other’s perspective. The differences in how inequality is perceived can also stall pro-poor economic policies. A good example is the reaction that some people (understandably) have to rising absolute inequality. The once widely-held ‘stylised fact’ of development that higher relative inequality is the unavoidable ‘price’ for growth and (hence) poverty reduction has been overturned in the light of new theories and evidence. Poor growing economies can and have avoided rising relative inequality, but they will have a much harder time avoiding rising absolute inequality—a rising absolute gap between the rich and the poor. And many citizens view inequality in absolute rather than relative terms. They are justified in taking that view; the concept of (relative) inequality held by most economists derives from an axiom that need not be accepted, and (indeed) appears to be rejected by many people. Those who view inequality as absolute and value it independently of poverty will see a trade-off between poverty and inequality. Ameliorating concerns about rising absolute inequality will almost certainly entail less progress against poverty. Urban poverty is another challenge. The urbanisation of poverty—whereby poverty rates fall more slowly in urban areas than in rural areas—is to be expected in almost any developing country that is successful in reducing poverty overall. Urban economies create new opportunities that poor people in rural areas have often sought out to improve their lives. Distorted urban labour markets can readily create excessive urbanisation, as can the lack of effective public efforts to promote agriculture and rural development; indeed, many developing countries have gone even further in (explicitly or otherwise) taxing the rural economy to support the urban economy. Removing long-standing policy biases in both taxation and public spending remains a high priority for pro-poor growth. No less misguided are restrictions on migration and urban policies that under-supply services to poor urban residents, including rural migrants. Poor people are often trapped as the victims of policies that simultaneously repress agriculture while making life difficult for rural migrants. Development policymaking needs to be more neutral to these two sectors of economic activity. That will probably still entail an urbanisation of poverty, but that should not be a cause for alarm as long as poverty is falling overall. The sustainability of poverty-reduction efforts poses a further set of challenges in assuring that we can reach the optimistic path. We do not want to reach the poverty-reduction target only to fall back in subsequent years. On an encouraging note, research has suggested that lower initial levels of absolute poverty at a given mean consumption foster higher subsequent rates of growth in average living standards in developing countries and help to ensure that economic growth itself is poverty reducing (Ravallion 2012). Thus, a ‘virtuous cycle’ can be anticipated that would help to ensure the sustainability of the reduction in poverty. The other side of the coin to falling absolute poverty is rising relative poverty. Economic growth has generally meant lower absolute poverty rates, but over time relative considerations have become more important. Such relative poverty is still poverty. Welfare concerns about relative deprivation and costs of social inclusion demand higher real poverty lines as average incomes grow (though it makes little sense for this to be a constant proportion of average income in developing countries). But progress against relative poverty will be slower. Even the optimistic path will leave another one billion or so people in the world who live above the frugal poverty lines typical of the poorest countries but are still poor by the standards of the countries they live in. This type of poverty can also be eliminated, but it will almost certainly require much stronger redistributive efforts than we have seen to date in most countries. The policies are available. The bigger challenges ahead are in assuring the political will and administrative capabilities to implement and enforce sound anti-poverty policies, and in adapting them to differing circumstances and evolving knowledge about their efficacy. Ravallion, M. (2012), “Why Don’t we See Poverty Convergence?”, American Economic Review 102(1): 504-523. Ravallion, M. (2013), “How Long Will It Take To Lift One Billion People Out Of Poverty?”, World Bank Research Observer 28(2): 139-158. Ravallion, M. (2016), The Economics of Poverty: History, Measurement and Policy, New York: Oxford University Press. UN (2015), “Transforming our world: the 2030 Agenda for Sustainable Development”, Resolution adopted by the General Assembly on 25 September 2015. 1 Also see the website, economicsandpoverty.com, which provides complementary tools for those using the book in teaching economics, as well as extra material, links to other relevant work and a forum for discussion. Author: Martin Ravallion holds the inaugural Edmond D. Villani Chair of Economics at Georgetown University, prior to which he was the Director of the World Bank’s research department. Image: An Indian boy from a family of labourers prepares to eat. REUTERS/Desmond Boylan.